This week the topic is math programs and organization. My district (Davis School District, UTAH) decided to write their own math program about 5-6 years ago for K-2. I was given the opportunity to be a lead writer for the project and learned a great deal... about mathematics and lesson writing! Since then, math has become one of my favorite subjects to teach. Funny, as a child and teenager... it was my LEAST favorite and my grades showed it ;) I guess it's true... we are never too old to learn and appreciate new things. Our program went through a little 'revision' when the Common Core was introduced. I made an outline of the curriculum to help me visualize the basic structure of our project. 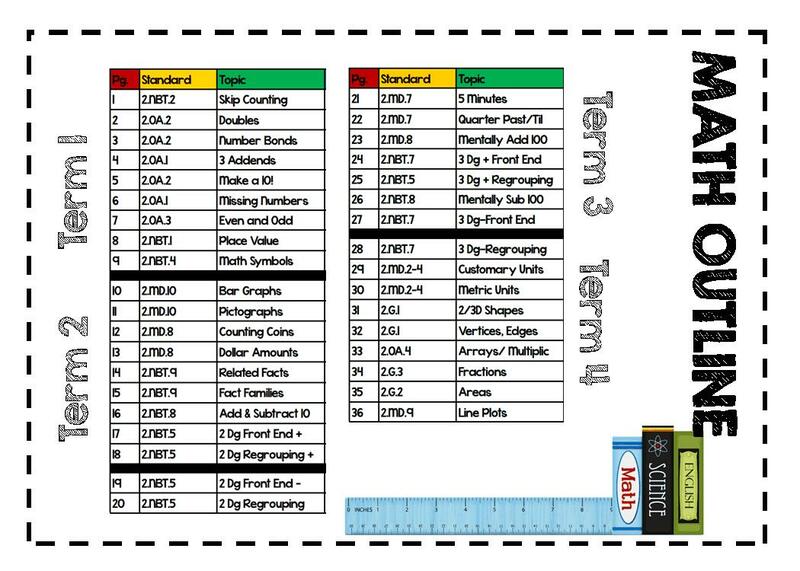 Below shows the 4 terms and when I plan to teach each CC standard. One piece of the program is math journaling each day. 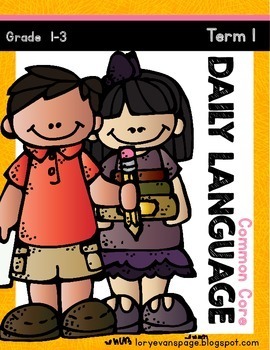 We focus on the concept we are teaching and give the students an opportunity to share in words and pictures their understanding. For years our journal was a full page. Recently, we have been trying to cut back on paper and copying so last year I tried to revise the assignment BUT stick to what the district expected us to cover. 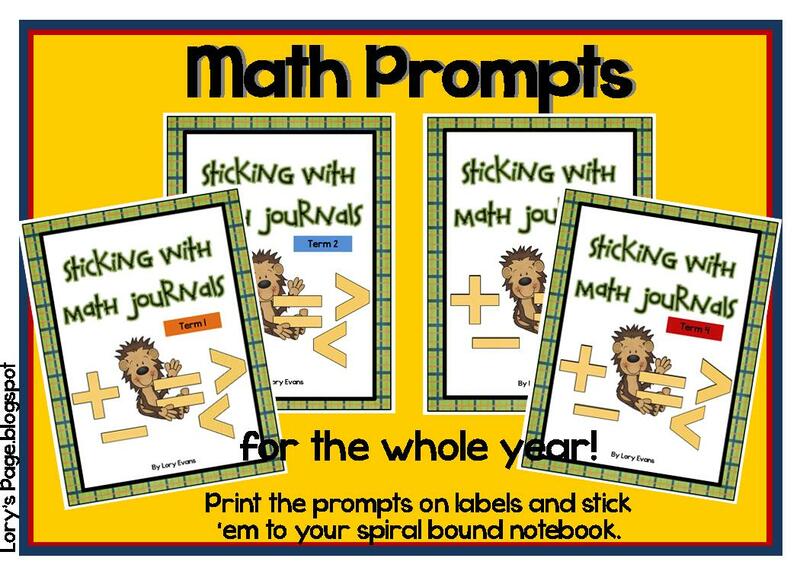 I found that inexpensive notebooks (17 cents at the BTS sales) and math prompts on mailing labels made for an easy, effective student math journal. Above you can see an example of how we worked the journals. Some days required a picture, other days number sentences, tally marks, charts, graph or sentences. Some days we took a few lines other days 1/2 the page. We were flexible... I wanted to be thorough and wanted the kids to understand the concepts and be proud. Many students chose to show their math journals during SEP conferences and it was nice because the parents could easy thumb through the pages and see the concepts being covered and their student's understanding. Another piece of my math is math stations. For the first 17 years, I never tried or had the desire to implement them. That was until Deedee Wills invited me to participate in a summer blog party reading and discussing Debbie Diller's math station book. It was a wonderful personal and professional opportunity. I gained a true appreciation for structured math stations. I understood the importance of students sharing math conversations and accomplishing mathematic tasks together. 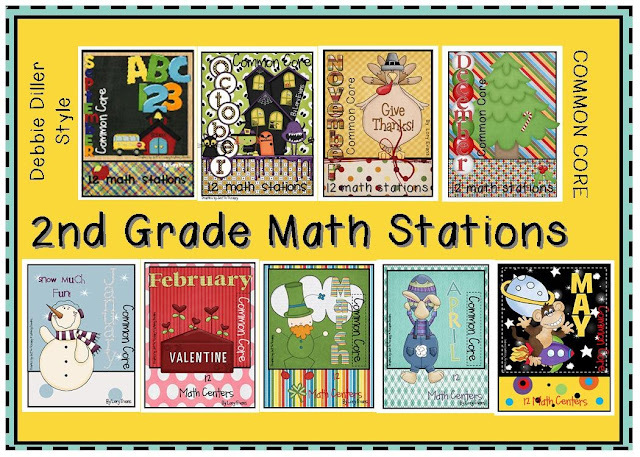 I enjoyed them so much I created math stations for each month of the school year. They build upon each other... progressively getting harder as the students become more independent with each concept. Each month the students receive a new partner to work with and complete the stations. 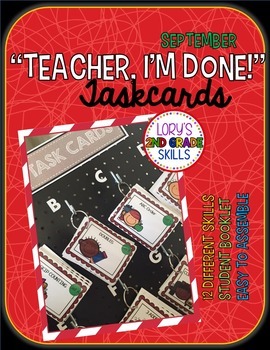 Expectations are to complete a hands on activity using the task card (instructions and hints), include 'math talk' cards during their work time, complete a journal/share page in the class booklet and then finally to complete an independent assignment on the specific concept. With each month I have also created a student booklet for the independent assignments. (trying to save paper there, too). 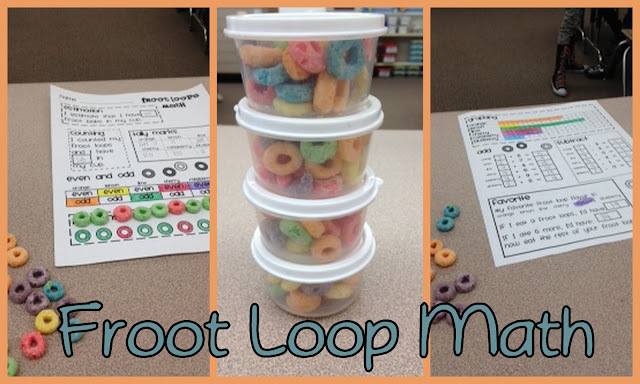 There are many ways to create math stations, I know that many teachers have creative math tubs for their students... this was the route that I learned a few summers ago and found successful. 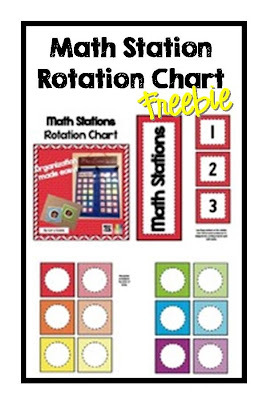 I uploaded a version of my simple ;) rotation chart for my math stations if anyone is looking for one and wants to save a few minutes. 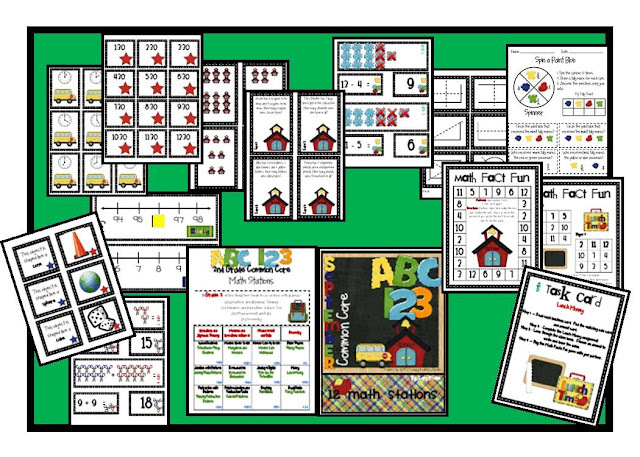 This upcoming year I am excited to try yet another math piece in my classroom. 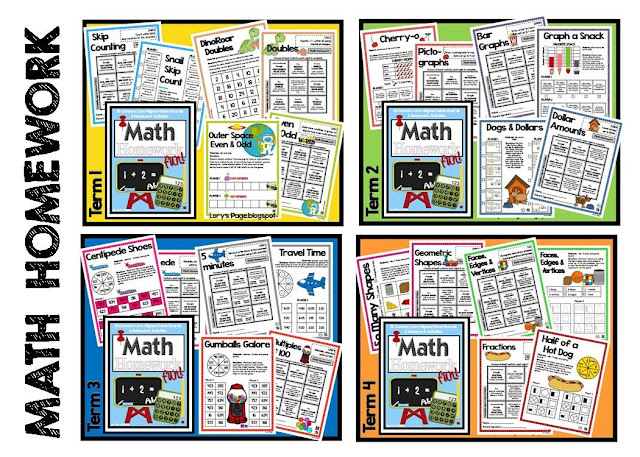 Our district math program has a homework page for each night of the school year. It is a simple task that should only take a minute or two. I believe it's purpose is to keep the communication open between school and home... hoping the parents will take a minute to see what their students are learning and IF they understand the concept OR need additional help. Again, I liked the idea BUT was concerned with the amount of paper I was using... 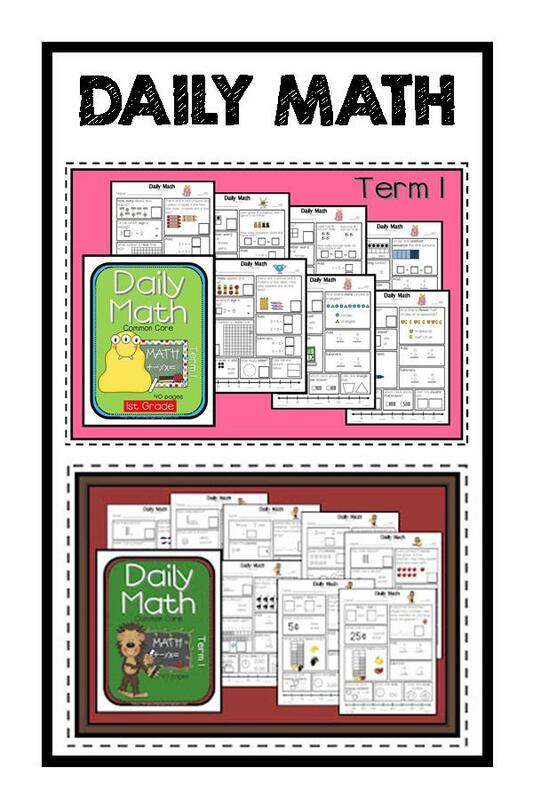 SO ... last year I began contemplating the idea of a weekly Math Homework page. 1 page/week! This is how it turned out... a game board on one side (dealing with the weekly concept in our lessons) and one side stating the Common Core standard and 9 choices for math homework, including the game board, an online game or activity around the house. I am expecting the students to choose 1 a night. I always have a couple of students that want MORE homework... they will be encouraged to complete more or all the boxes. Parents and students sign their weekly progress/ work and return the page on Friday. 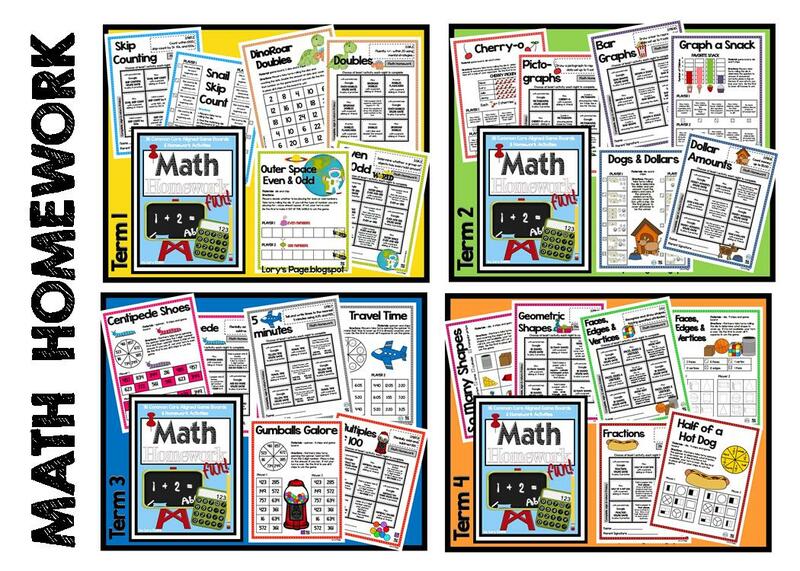 My thought is have the student place these pages in a 3 prong folder each week after returning them... compiling a folder of 36 math game boards by the end of the year. As a gift at the end of the year... I give them a set of dice, spinner and transparent chips along with their MATH Games to play over the summer to stay polished up on their new skills. We'll see how it goes... I'm excited. My 3rd grader has been playing them throughout the summer with the neighborhood girls. It is fun to hear them use 'math talk' and review their math understanding. 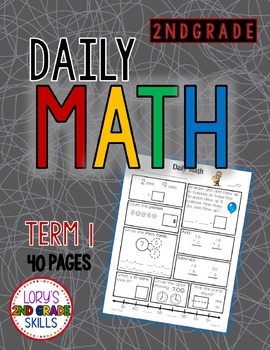 Daily Math is a spiral review that I have used with my kiddos for over 10 years. It has changed names and graphics but this set has been around for a few years and seems to be the favorite. It is simple with 10 questions each day created a spiral, independent review. This is actually what my students walk into each morning to complete. Lastly... I love to have fun with math. I want my students to enjoy their math experiences... a whole lot more than I did mine ;) That is why I tend to find the time to do FOOD MATH or activities that seem a bit 'fun'... however, I always try to make sure it is to help their math understanding and success. I will forever be grateful for Deedee and the opportunity she gave me to learn a new trick for my students and classroom. I love to learn and look forward to hearing your mathematical words of advice. Please feel free to share your ideas below. 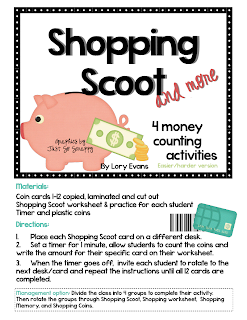 2 copies of SHOPPING SCOOT. Until then be sure to grab yourself a set of Math Flashcards, Apple Bump (skip counting), School Bus Bump (skip counting), Beep Beep Game board (basic math facts), along with many monthly (holiday) FRUIT SNACK FOOD MATH freebies in my store. I teach first. Thanks for the great ideas. I love your products! I teach Grade 1. I heart your products!! I teach a 1/2 combo class, however I would love to receive anything for my 1st graders. I love ALL your work! I love your Sticking with Math Journals and everything else! 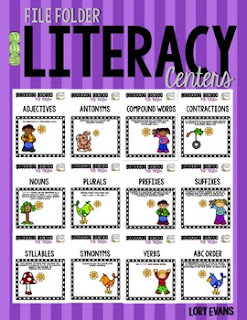 These would be perfect for my first graders!! First Grade is a Treat! I teach 2nd grade. I purchased your Math Stations last year and used about half of them. I can't wait to use them all year. I LOVE them. I teach first grade and love your acivities. You do an awesome job! I am a bit like you used to be...I haven't tried math stations, but you have made me change my mind! I LOVE your math help! I used a little bit last year, but my shopping cart is FULL of fun stuff to use throughout the year. Thank you for taking time to create the goodies and most of all sharing it with us! I feel like you might have saved my kids lives. I have only taught reading for 11 years and this will be the first year I have a self contained class again. I need all the help I can get to help my kids!!!! I teach 2nd grade in a very small school. I say small because we only have one teacher per grade, but we all have over 30 kids each year. 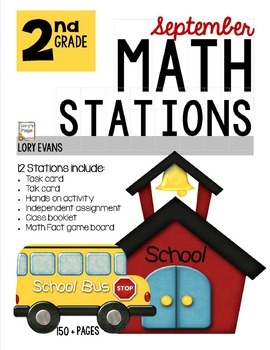 A year ago, I found you somewhere online, I bought some of your math stations and never used them. In fact I bought Suessalicious - Stations and never downloaded and now can't. 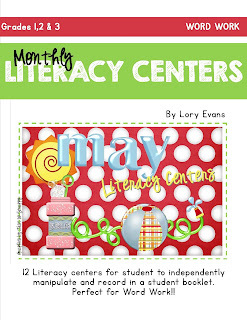 I have been afraid to use math centers. 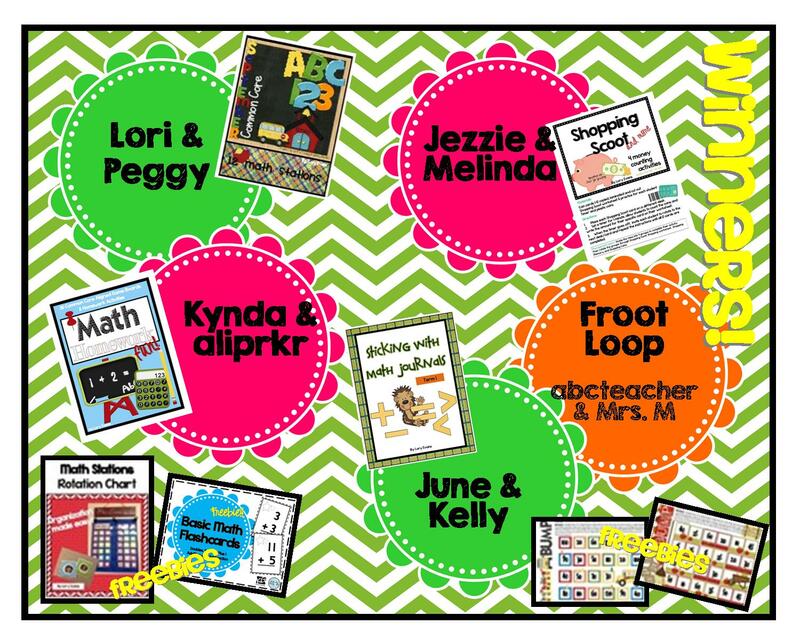 This summer I read Daily 5, and Debbie Diller math work stations. 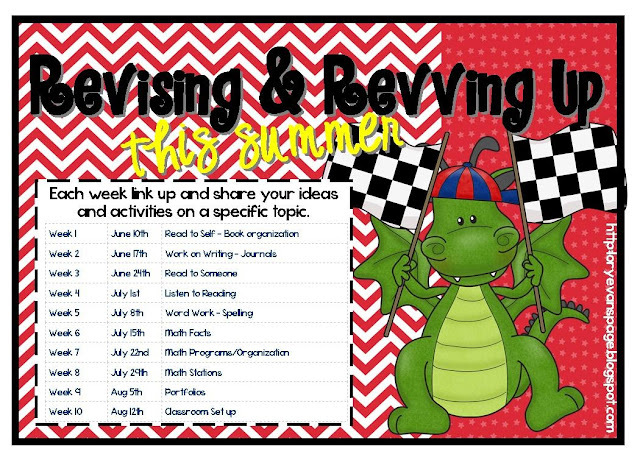 I stumbled on to a teacher blog and found blogs and freebies a couple of weeks ago. I think I am now a little more prepared. So I want to say thank you for giving me many great products and the incentive to do better. I am amazed at the time and care you have put into all of this, to help teachers like me - THANK YOU! Alicia - Second Grade, I would love your Homework packet. Do you have links to your images, like the Math Outline. I could use something like that, we currently use whatever we can with no district guide. Will you please PLEASE do stick with math journals for 1st grade?? I am a huge fan!! I teach 2nd grade. Loved using your math centers last year! I purchased your math stations and they look great! I teach 2nd grade. 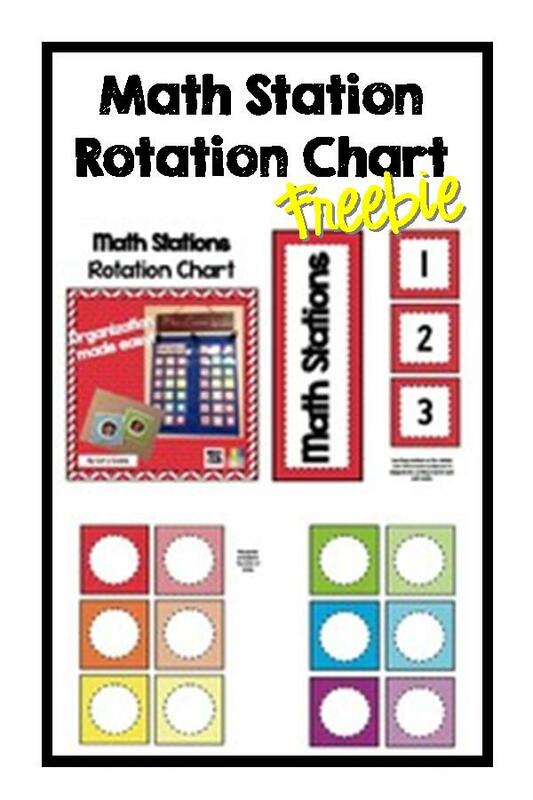 I have purchased all of your math stations, daily math, and most of your literacy stations. Love, love, love your products. I teach 2nd grade. I teach 2nd! I love your products! Love your products and blog. I teach second grade and worked in my classroom today! 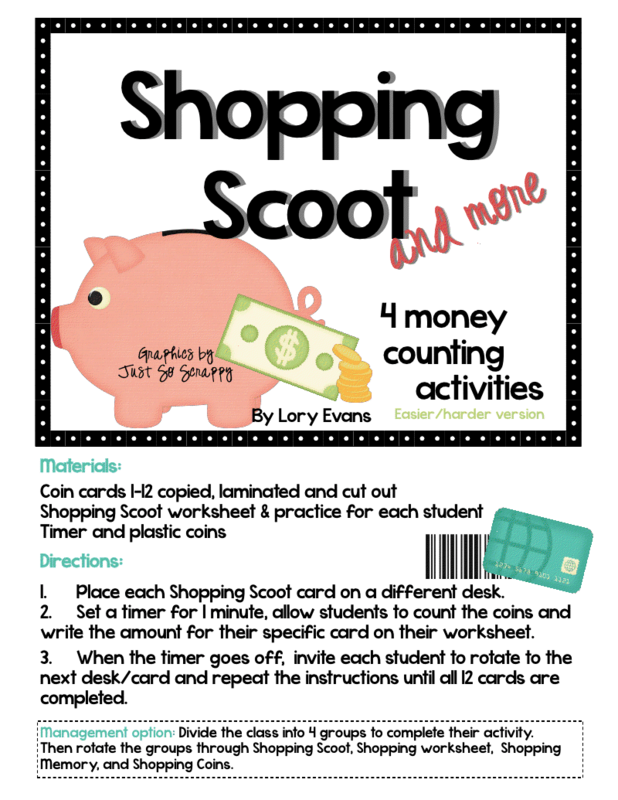 I teach math in a workshop format and students complete various centers: math journal/practice facts, at your desk, teacher time, hands-on (the four together spell MATH!). 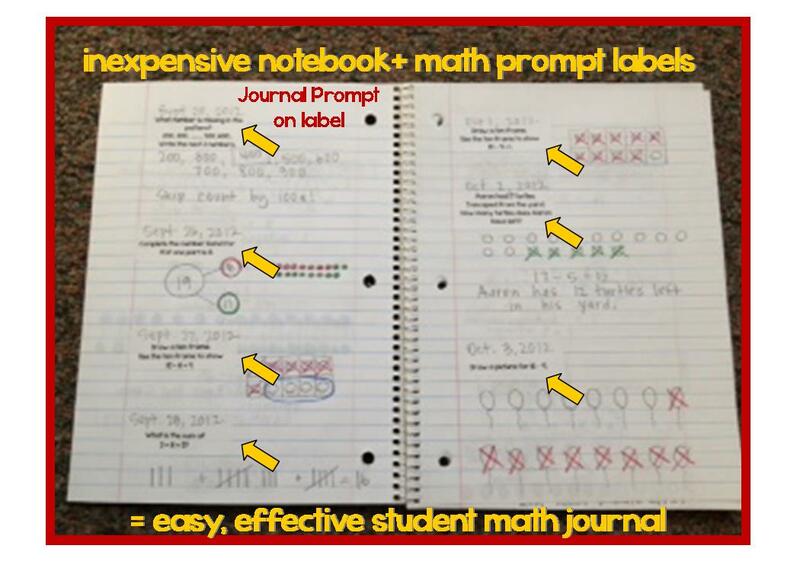 Have never tried math journals with sticky labels- love that idea! Thanks. I may have asked this in a previous post, so please forgive me. Have you considered adding a short (few pages) assessment to go along with each month's math stations? 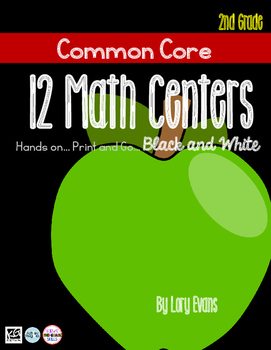 I did purchase your common core assessments and those are great throughout the year. However, I would like an assssment that the kids could take individually at the end of each month that specifically corresponds to that months activities. My students work in groups during their station time and complete the worksheets together. This makes it difficult for me to know if each student actually does understand the concept or if they just have a good partner who does. It just seems like those same skills could be assessed using the same format they are familiar with from the monthly stations. Not sure if this makes sense to you, but thought I'd throw if out there. Or, maybe you have a suggestion for me. I'd appreciate your feedback. Thanks. I teach 1st. All of this looks great! Lory your materials are amazing. I have used Daily Math and your Math Stations in the past. The students not only enjoy them, but are learning the whole time they are working on them. Thank you! 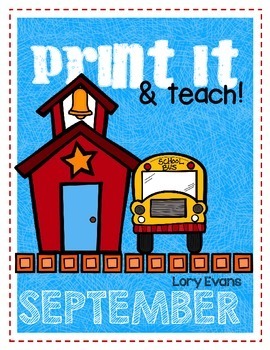 I teach second grade and whenever I need new materials, I come to your blog and TPT store. I have been out of town on vacation and noticed that I was listed as a winner. I looked through my inbox and trash and didn't see anything? I found it - didn't recognize the e-mail. You could probably feel the ground moving from me jumping up and down!! !